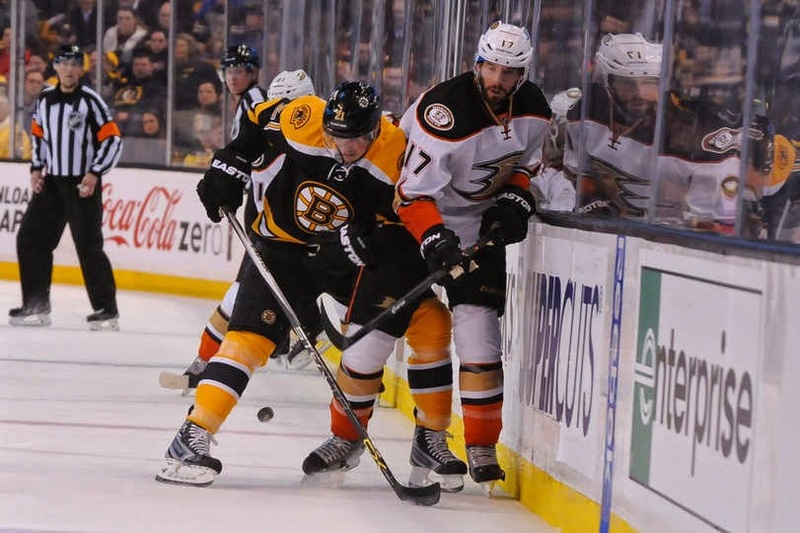 In what was a must win game for the Bruins, they were not able to get the job done, as they ultimately fell to the Anaheim Ducks in overtime. After almost allowing a goal in the first minute, the Bruins eventually settled down, in what was a tight checking first period. Both Milan Lucic and Adam McQuaid were involved physically throughout the first 20. One of the better chances for the B's was generated by the fourth line. Talbot, rotating as the high forward, was able to slide a pass over to a pinching Torey Krug, who was able to get a great shot on net. The first powerplay went to the Bruins, as Patrick Maroon, was called for hooking after a solid rush from the Lucic-Spooner-Pastrnak line. However, the Ducks arguably had the best chance, as they found themselves alone in on Tuukaa Rask. Towards the end of the period, Francois Beauchemin was called for a trip. What the refs didn't see, was a high hit to Matt Beleskey delivered by Adam McQuaid. There was no call on McQuaid which led to the second powerplay for Boston. Boston moved the puck well on their second man advantage but couldn't put one home. The second period opened up with Torey Krug getting another great chance, as a result of a broken stick by an Anaheim defensemen. However, it was Patrick Maroon who would get the first goal of the game. On what didn't didn't appear to be a strong rush, Maroon was able to walk right around Matt Bartkowski, on his way to roofing one under the crossbar. The bruins woke up after that goal, and their desperation got them back into the game. A solid shift from the Bergeron line, followed by a strong chance for Louis Eriksson resulted in another powerplay for the Bruins. The Bruins would tie the game on their third powerplay, on a beautiful shot from Ryan Spooner. Bergeron made a solid pass to him, just inside the blue line and Spooner did the rest, beating Frederik Andersen to the far post. At the tail end of the second period, Milan Lucic made a great cut to the net and was able to draw a penalty on Simon Despres. Lucic and Despres had been going at it all night. That penalty gave the Bruins some powerplay time that carried over into the third. The Bruins made good on Lucic's effort. Louis Eriksson would get his 19th goal, team leading 6th powerplay goal, just 27 seconds into the third period to give Boston the lead. The third period was another tight checking period. Tuukka Rask came up big for the Bruins, making key saves. The B's were able to kill off a delay of game penalty, but Anaheim continued to storm the Boston end. With the goalie pulled, the Ducks were able to score the game tying goal, with just 38.5 seconds left. A tip-in by Corey Perry silenced the crowd. Here's a look at the Perry goal. There is an argument to be made here for goaltender interference. The game would head into overtime where the Bruins were able to kill a penalty on a questionable call made on Zdeno Chara. Momentum, however, was still on Anaheim's side. Ryan Getzlaf would carry the puck into the Bruins zone and rifle one past Tuukka Rask, to give the Ducks the come from behind win. Follow Chris Kuzyk on Twitter @_K00Z_ and follow @BruinsLife for the latest Bruins news and updates.